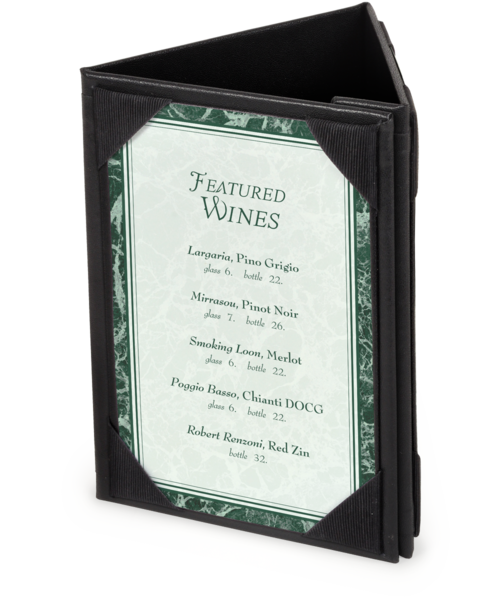 Promote even more drinks and specials with our NEW 3 Sided Table Tent. 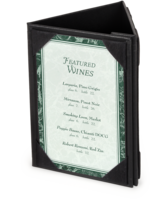 Made from Black Leatherette, this Triangular Table Tent will hold 3 cards measuring 4 in. x 6 in., 3 3/4 in. x 8 in., or 5 in. x 7 in. using Black Picture Frame corners. Magnetic side panels allows this item to lay flat for convenient storage and cleaning. Both sizes in stock and available for immediate shipping. 360 degree visibility of your display cards . Sizes shown are of inserts that fit into these table tents. Actual size of tents is slightly larger. Clear vinyl overlay sheets are sold separately in Packs of 50. Click here to order. 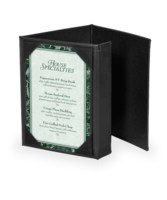 3 Sided Leatherette Table Tents. Shop online with the Menu Shoppe today.